We’ve reached that point in the year when juvenile salmon and steelhead that have been released in upper Deschutes basin tributaries to support anadromous fish reintroduction above the Pelton-Round Butte dam complex are migrating downstream to the Lake Billy Chinook reservoir. Ultimately, these out-migrating juveniles are to be captured at the fish collection facility at the Selective Water Withdrawal (SWW) Tower, located in the forebay of Lake Billy Chinook. At that point, the collected fish are trapped, tagged, and then trucked around the three dams comprising the Pelton-Round Butte dam complex to be released into the lower Deschutes River. This migration period will continue through June, with peak reservoir migration occurring in May. This juvenile downstream migration also marks a period during which 100% of the water released from Lake Billy Chinook and discharged into the lower Deschutes River comes from the surface of the reservoir. This maximum surface water discharge is done to provide surface currents for juvenile migrants to navigate through the reservoir to the fish collection facility. The question is: are juvenile salmon and steelhead making it to the fish collection facility? SWW Tower and fish collection facility, located at the downstream end of Round Butte Dam. Round Butte dam is in the foreground. Photo by Greg McMillan. In 2014, there was a combined 714,948 steelhead smolt and fry released into upper Deschutes basin tributaries as part of the Pelton-Round Butte reintroduction project (see Graph 1 below). That same year, 2,113 juvenile steelhead were captured at the fish collection facility. This equates to a 0.3% collection rate, which marks the lowest number of juvenile steelhead collected at the fish collection facility in any year and represents a declining trend in juvenile steelhead collection since these data were first reported in 2010. This decline persists in spite of the fact that every year since 2010 a relatively comparable rate of steelhead smolt and fry were released into the upper Deschutes basin tributaries to facilitate reintroduction (620,000-720,000 on average). Graph 1. Source: 2007-2014 PGE Annual Fish Passage Reports to Federal Energy Regulatory Commission. The percentage of juvenile spring Chinook captured at the fish collection facility has been larger than that of steelhead, but overall the results are equally underwhelming. In 2014, the fish collection facility collected 7% of the number of juvenile spring Chinook that were released in that same year (see Graph 2 below). In fact, 2014 marked the lowest number of spring Chinook collected at the fish collection facility in any year and reflects a declining trend that has averaged roughly 19% fewer fish captured each year since 2010. Graph 2. Source: 2007-2014 PGE Annual Fish Passage Reports to Federal Energy Regulatory Commission. It is important to note that it may take several years for juvenile salmonids released in the upper Deschutes tributaries to achieve smolt stage and out-migrate to Lake Billy Chinook. Thus, we’re not drawing direct comparisons of the same fish that are released in a given year to those that are collected in that same year. However, these comparisons do depict an alarming trend in the effectiveness, or lack thereof, of either the SWW Tower to collect juvenile salmon and steelhead or the upper Deschutes tributaries to rear juvenile salmon and steelhead to smolt stage. So, why aren’t juvenile salmon and steelhead making it to the SWW Tower fish collection facility? There’s no easy answer to this question. Juvenile salmon and steelhead are clearly not making it to the fish collection facility with any efficiency. It could be due in part to predation or residualization in the tributaries or reservoir. Fish diseases and external parasite infections in Lake Billy Chinook are also thought to be problematic. However, annual studies conducted by PGE have yielded concerning data about SWW Tower collection of fish that have entered Lake Billy Chinook. The graphs below (Graphs 3 and 4) represent populations of juvenile steelhead and spring Chinook that were captured near the Deschutes, Crooked, and Metolius River tributary mouths to Lake Billy Chinook, tagged, and released at those same locations. The percentages in graphs 3 and 4 account for the number of these tagged juvenile fish that successfully navigated through Lake Billy Chinook to be captured at the SWW Tower fish collection facility using the surface water currents created by the SWW Tower. In this case, “Naturally reared” refers to fish that are raised to fry in hatcheries, released in the upper Deschutes basin tributaries without fin markings, and naturally rear in the wild before out-migrating. “Hatchery reared” refers to fish that are raised to smolt in the hatchery, then fin marked, and released in the upper Deschutes basin tributaries to out-migrate. Graph 3. Source: 2010-2014 PGE Juvenile Migration Test and Verification Study Annual Reports to Federal Energy Regulatory Commission. The annual capture rates shown here are clearly low. The red line in each graph represents the goal outlined in the Pelton-Round Butte dam complex federal operating license of a 75% or greater juvenile fish collection rate over a four-year running average at some point within the first twelve years of juvenile fish passage in Lake Billy Chinook (2005 License, Federal Energy Regulatory Commission Project No. 2030-036; pages 146, 161). These data account for almost half of those first twelve years, and rates of juvenile fish collection at the SWW Tower are far from the goal. Equally disconcerting is the mostly declining trend in juvenile fish collection, particularly for naturally reared juveniles since the reintroduction effort ultimately intends to support self-sustaining, wild runs of salmon and steelhead. 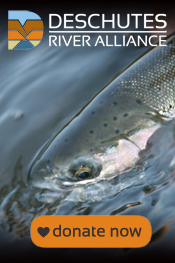 To be clear, the DRA supports the reintroduction of salmon and steelhead into the upper Deschutes basin, and we continue to advocate for successful reintroduction. However, we believe that current management of the SWW Tower as a function of the reintroduction effort has generated unintended, adverse environmental impacts on the lower Deschutes River while at the same time not coming close to meeting stated reintroduction goals. The DRA has been documenting these damaging environmental impacts over the past several years. They include (but are not limited to) the rampant proliferation of nuisance algae, altered water temperature cycles, changes in aquatic insect hatch timing, and declines in aquatic insect populations. In light of these impacts and their possible implications on fish habitat and fish populations in the lower Deschutes River, it is imperative that alternatives to current management of the SWW Tower and the reintroduction project are urgently investigated and implemented. Salmon and steelhead reintroduction in the upper Deschutes basin and ensuring the health of the lower Deschutes River do not need to be mutually exclusive pursuits. It’s time to explore approaches that best achieve both goals.